This beautiful and refined sculpture of a sleeping woman is from the Hypogeum in Malta and of about the same period as the megalithic passage chambers of the British Isles, that is 5000 years old. 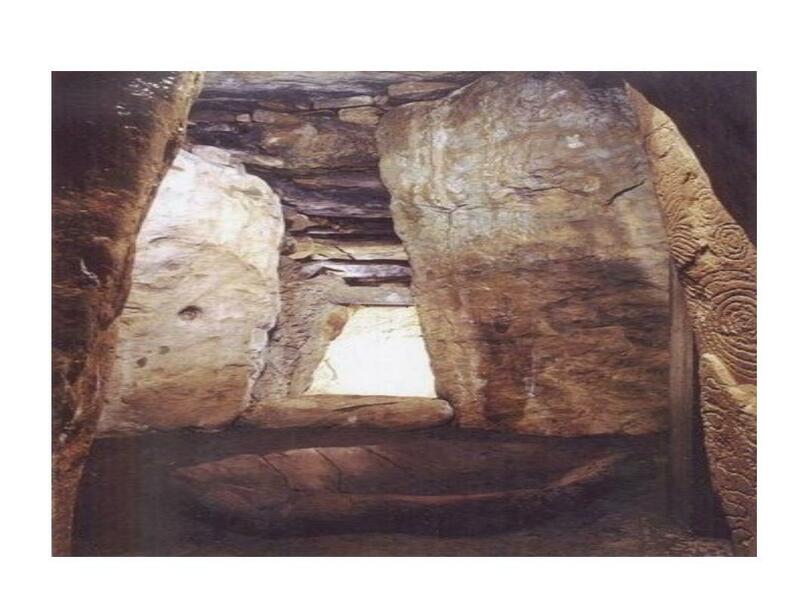 The Hypogeum itself is an extraordinary structure and comes closest in architecture and sophistication to the Maeshowe group in Orkney, but it has not got the same kind of geometrical discipline as we see it in Orkney. On the other hand the refinement and expression of this sculpture is unparallelled in the Stone Age, as far as I know. 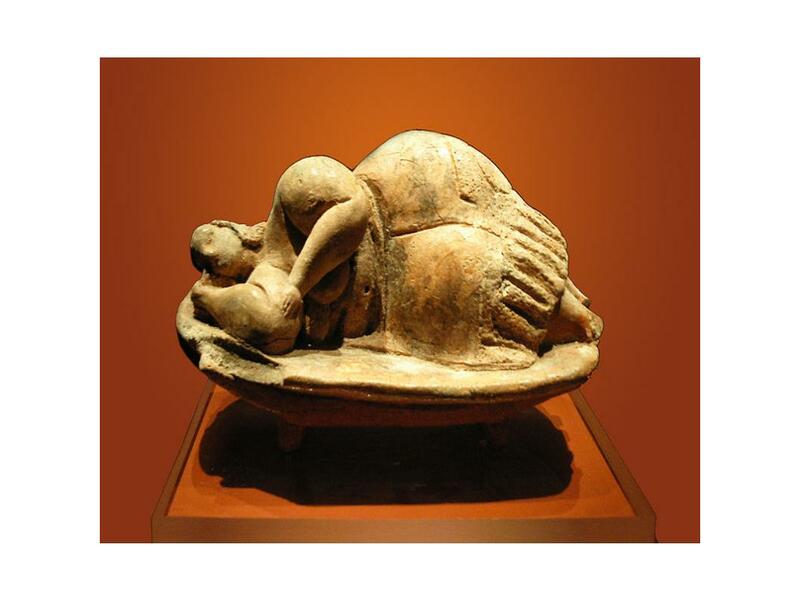 In my view this figurine depicts the blissful sleep of a woman after childbirth, sleeping on the child bed. 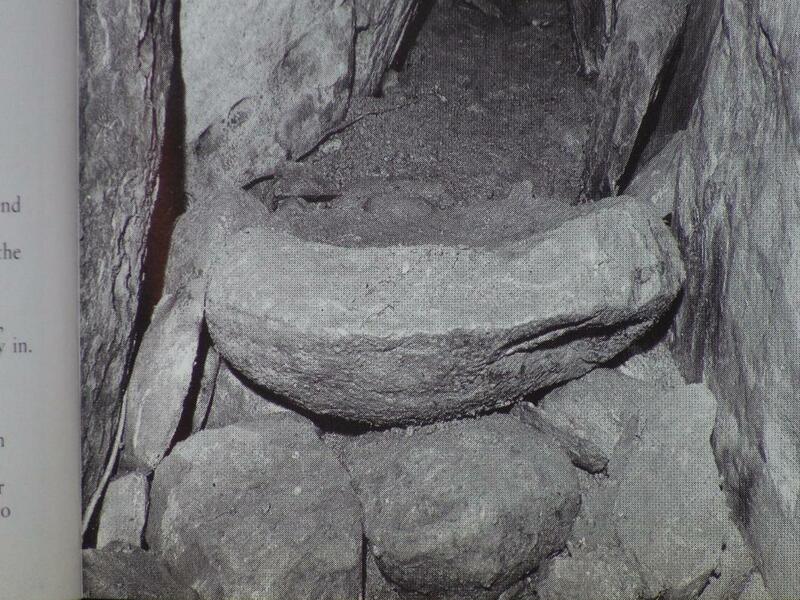 At long last I publish here one of the major themes of my lecture for the Orkney Archaeology Society in 2009, which concentrated on a specific use of the megalithic chambers, apart from their refuge function, that is, that of delivery room for pregnant women. See this against the background of the very high mortality rate of women, which may have been exacerbated by very young women becoming pregnant. This would explain the sometimes seemingly small size of the child beds, but also women would be smaller in general. The famous sleeping figurine of Malta also shows the relatively small size of the child beds and the universal form they seem to take. 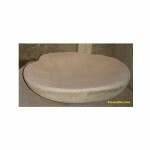 The hollow form is ideal for childbirth, considering the material, but not for a regular bed. The idea of women in childbirth in the chambers came to me as a natural consequence of prolonged refuge in the chambers, especially during the cold winter months. Nature does not wait and childbirth comes when it comes, also under severe weather conditions. 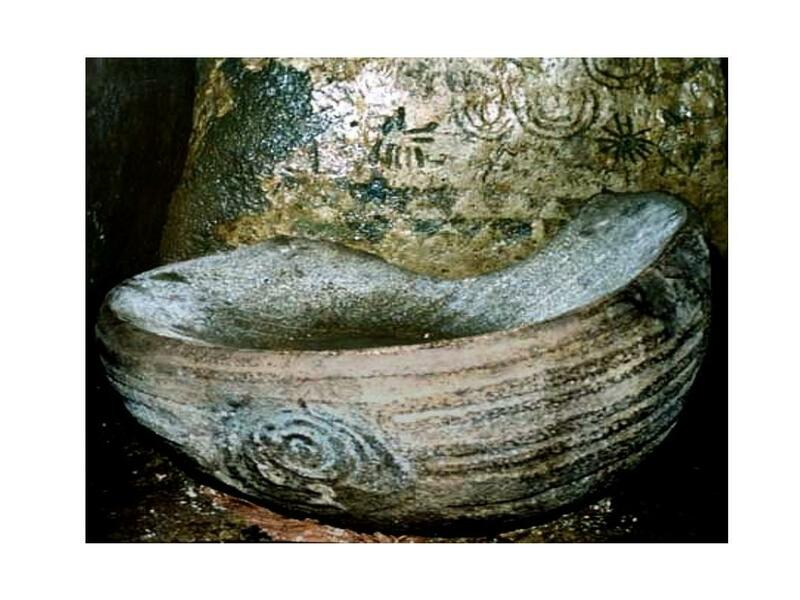 The idea of a child bed occurred to me first when I saw the pictures of the stone basins of Loughcrew, Dowth and Newgrange, so very unlike the round or oval shaped basins of the well-known pictures; these other basins were big and elongated and immediately gave me the association with a bed. 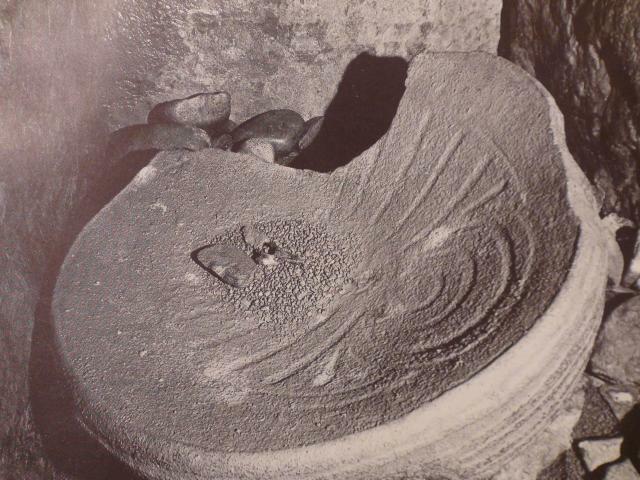 Suddenly the two came together in the placement of the basin in cairn L, its privacy, and the interior compartments of the whole chamber where the many compartments could hold sitting/sleeping midwives attending at the birth-process and the aftercare. On Orkney it was tradition until recently that up to 6 midwives were involved in childbirth and aftercare, and the Orcadians are one of the few long isolated populations of which it is practically sure they go back to the Stone Age and the builders of the chambers, they may even go back to the first settlers in the basin of the present North Sea. This is my conclusion upon reading People of Orkney,1986. Some traditions are timeless. 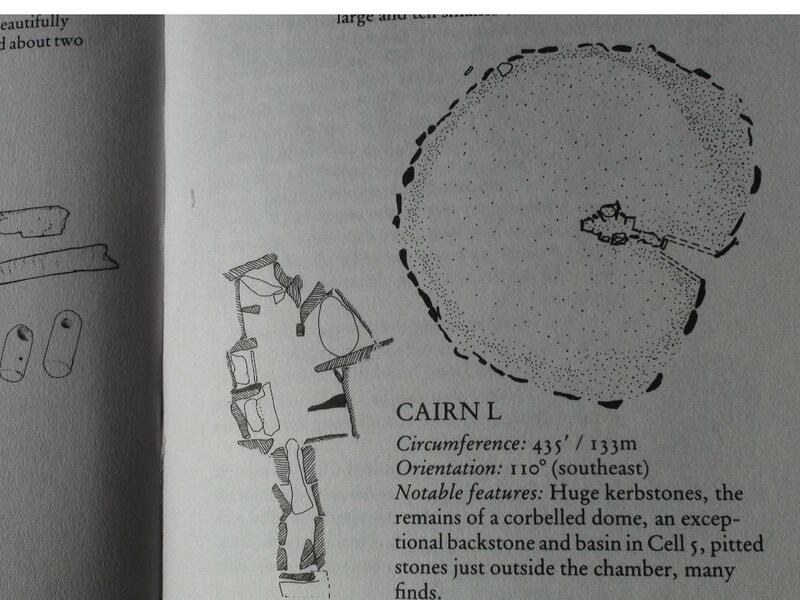 The plan of Cairn L at Loughcrew (enlarge) is the most convincing lay-out for a delivery room, with up to 7, one-person recesses or some, possibly, spaces for smaller basins (cradles). 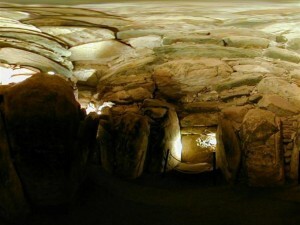 This specific chamber would initially have no other function than being a maternity clinic, it differs significantly from the other big chamber at Loughcrew, Cairn T, which has the observer-unit design of a communal space with 3 recess facilities for 3 individual nighttime observers, who did not make a fire so as not to impair their eyesight. 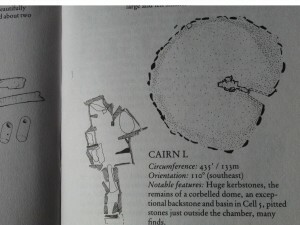 Cairn L is surrounded by 41 kerb stones, 41 being half of 82, the number of 3 sidereal/tropical moon cycles of 27.32 days and thus the exact number of days in the ideal rhythm of 3 female fertility cycles. (Conwell counted 42, Jean McMann 41 stones, I bet on Mc Mann). 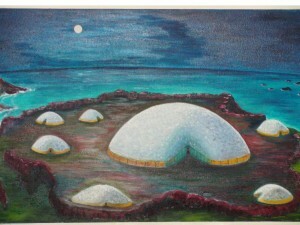 It is of some importance to note here that the female fertility cycle is not related to the apparent relation between earth and moon, 29,5 days (synodic or lunar month), but derives from the cycle of the moon in relation to the solar system (tropical month 27,3215…days) or the fixed stars, the universe (sidereal month 27.3216…days). This in my view shows that the highest principles of life relate to the solar system or the universe, not to the earth itself. This would suggest that the laws of life are universal instead of earthbound; this does not necessarily mean there must be extra-terrestrial life forms, although it does emphasize that living nature reaches beyond the earth. Dowth North would have been an operation theatre. 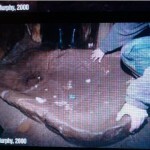 The basin in Dowth is special because it is in the middle of a larger space, around which some six people could be grouped. These would be needed to keep the patient under control which would no doubt suffer a lot of pain during the operation. We know they did operations. 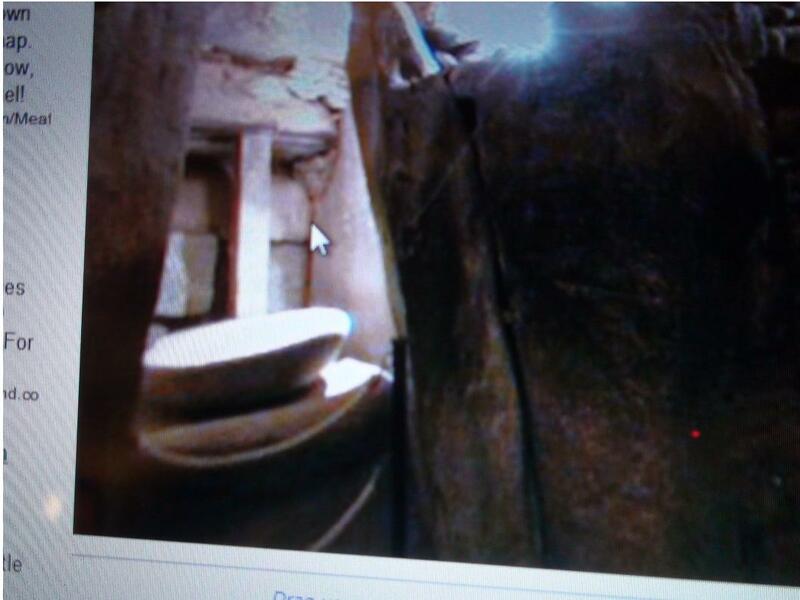 I now sincerely think that all the main chambers mentioned here had a clinical function, and that the round basins were also used as washing basins, they are usually in secluded spaces (pillars!, see pictures). Cairn H (Carrowkeel), cairn L (Loughcrew), Knowth, Dowth north, Newgrange (Boyne Valley) and Maes Howe, possibly Vinquoy Hill (Orkney), it were all (partly) clinical facilities and when not in use as such, they would have been used as living spaces by the astronomers, the scientists, who were awake during the night and slept during the day and who would have been the skillful builders of the well-thought through multifunctional spaces in the first place. 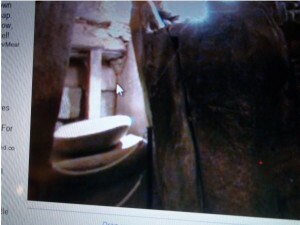 These chambers are all in big mounts and often have a central position in a gathering of other smaller chambers. The point of the massive mount is that: the bigger the mount, the bigger the mass, the more even the temperature inside all year long. It probably never freezes inside a dry passage chamber, even without closing-off the passage by a stone or hides. 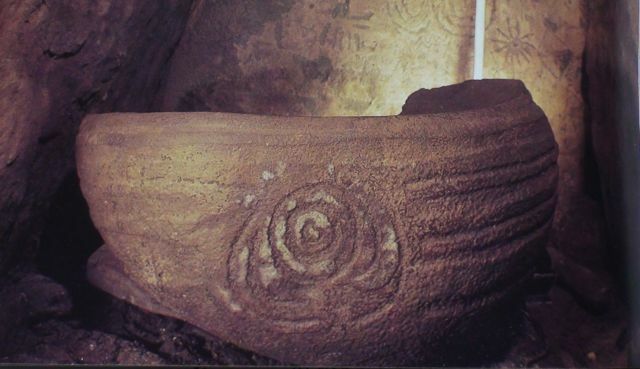 Maeshowe’s stone door is closed from the inside, with about 10 cm air space above it; it has not been recorded yet, that the dead need fresh air or that they close their own burial chambers; and every bit of its architecture is functional in Maeshowe. 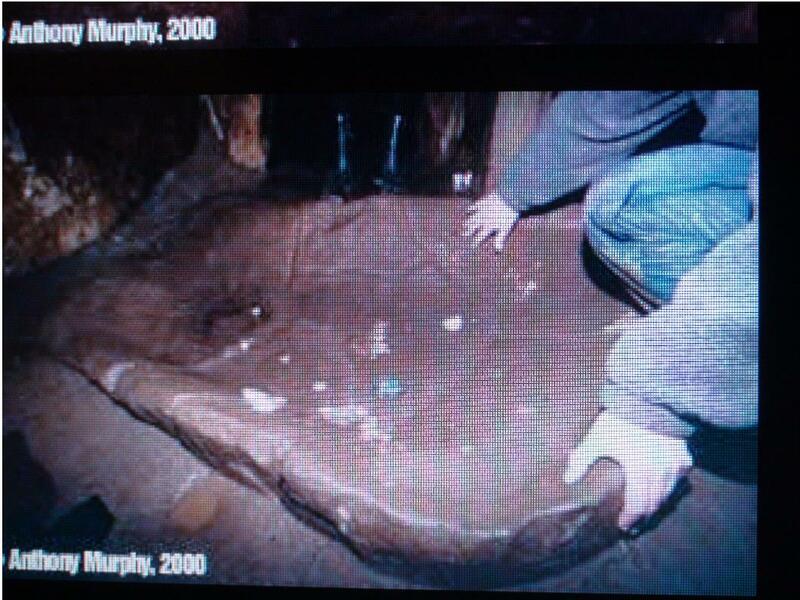 Unfortunately there are very few untouched original chambers left with that unspoiled quality; but there are a few. Many of my ideas and theories can be scientifically tested and verified or falsified, that is what makes them interesting to me. This work is not meant to add a few interesting new ideas, but to make a real difference, that is why I hope I can challenge people to prove me wrong. We are talking here about an important change in perception of the late Stone Age culture from primitive, savage, pagan barbarians into sophisticated scientists and architects (no priests, rather wizards or shamans). I am not the first to claim this, but I think I have gathered what are among the best and most convincing evidence and arguments. Many of the so-called foundation burials I view as regarding people who died by accident in the process of building the chamber or stone circle (these can also be children) and thus were honoured as a sacrifice towardKs the eventual beneficial use of the building, this would enhance the power of the place to protect and benefit the community. I don’t know of any strong evidence of human sacrifice in the late stone age or, specifically, the original megalithic culture, which probably died out in spirit with the improving climate after 2900 BC and with the end of the use of the chambers as communal survival centres. On the British Isles this spirit, though, may have survived longer than on the continent. It is in the ensuing period that some chambers started to be used as burial places, but given the enormous span of time the chambers were used, from hundreds up to maybe a thousand years, the amount of bones in them is usually scant and of the later phases, the interments sporadic. It is also only for a certain period that churches became used as burial places, but that does not change churches into tombs, other than in a technical sense. The chambers had a variety of functions when built, which we can infer from their different architecture, but the created space was for the benefit of the living, not for the burial of the dead. And that is of course what makes the most sense any way. 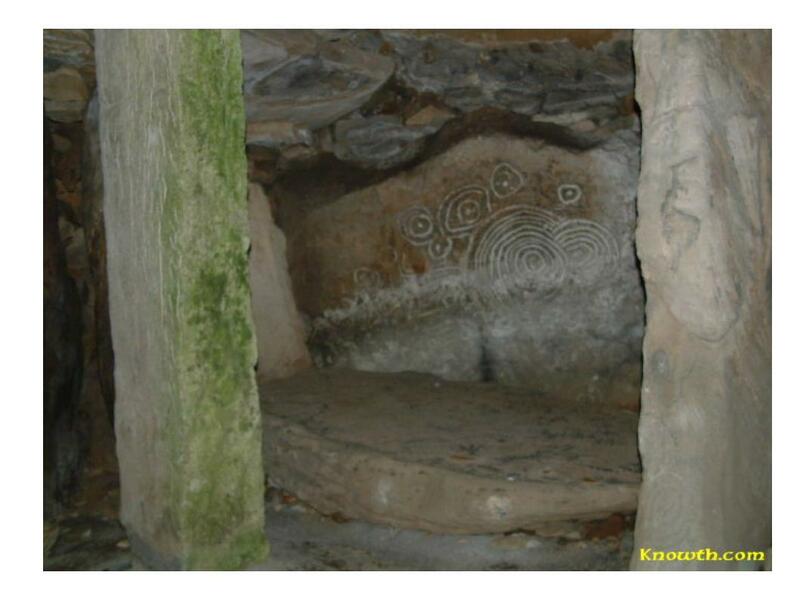 Knowth East stone basin, note the outside stone carving which can easily be associated with childbirth, the carving in the inside of the basin can be seen as a sun rising (east) between hills, but also as a head emerging from a womb. 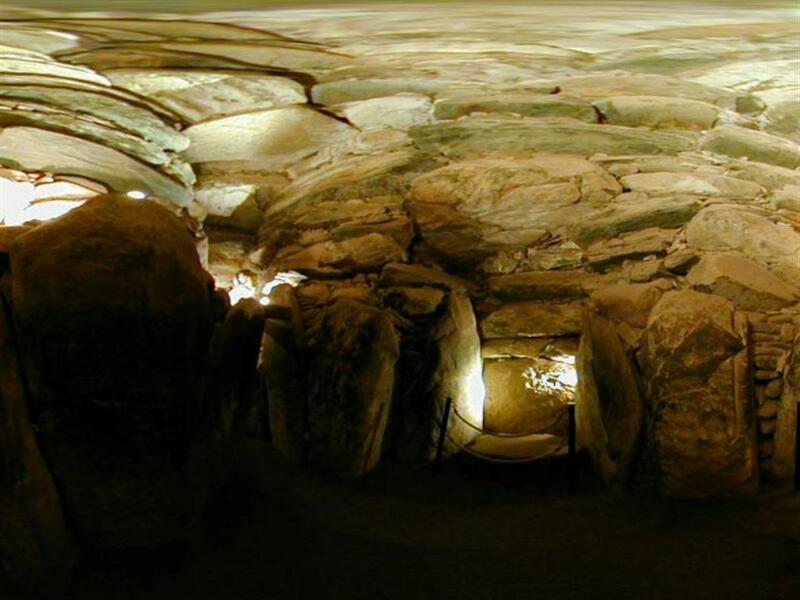 Note the uprights which make it a more private space, as in Cairn L and Knowth East. 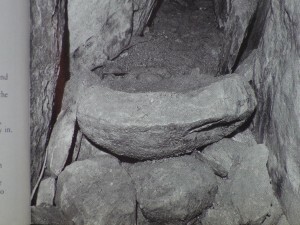 The indentations at the left hand side of this small basin (enlarge), – on top of another basin in Newgrange (see picture above)- could be hollows for the young woman to place her heels. 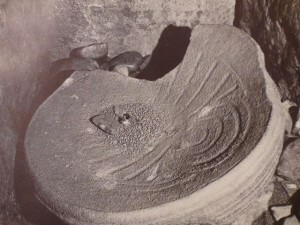 I know too little about childbirth to give a judgement on the suitability of the basins for childbirth but the figurine of the Hypogeum (Malta) can be placed in the same context, also on a relatively small oval shaped basin. 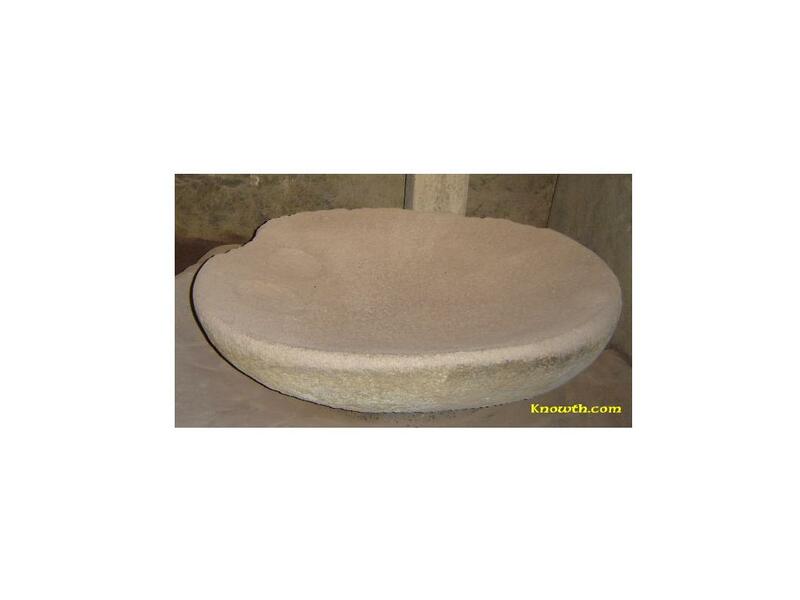 Important is the multifunctionality of the basin, as child bed, as cradle, as washing basin and as resting place, these functions can be changed instantly. 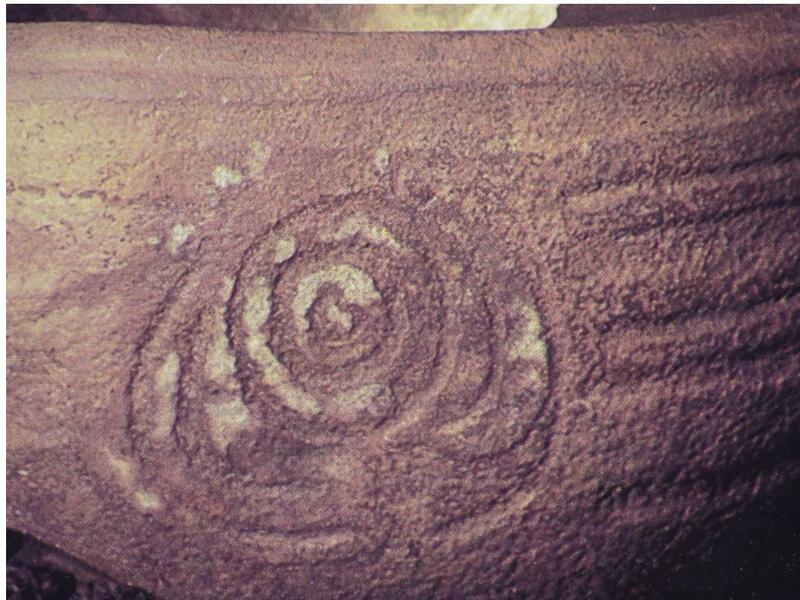 I believe in the multi-functionality of many of the Stone Age artifacts and also of the huge chambers, which were originally essential places for survival of communities, plagued by alarming demographic imbalances in a deteriorating climate.